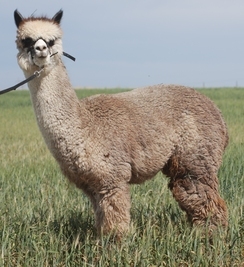 Aladdin is one of those rare herdsires that is fine, consistent and dense. 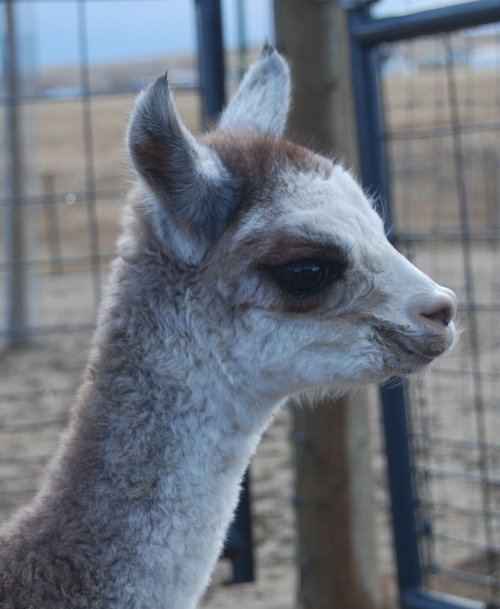 In addition, he maintains that fineness in both himself and his cria which is one of the main keys we are all breeding for in alpacas. Add his typey head and dense bone structure and Aladdin is exceptional for any breeding program. Aladdin is a son of the late 5Peruvian Royal Inca Legend. Inca Legend is known for throwing incredible greys and blacks and his offspring are well known as winners in the show ring. 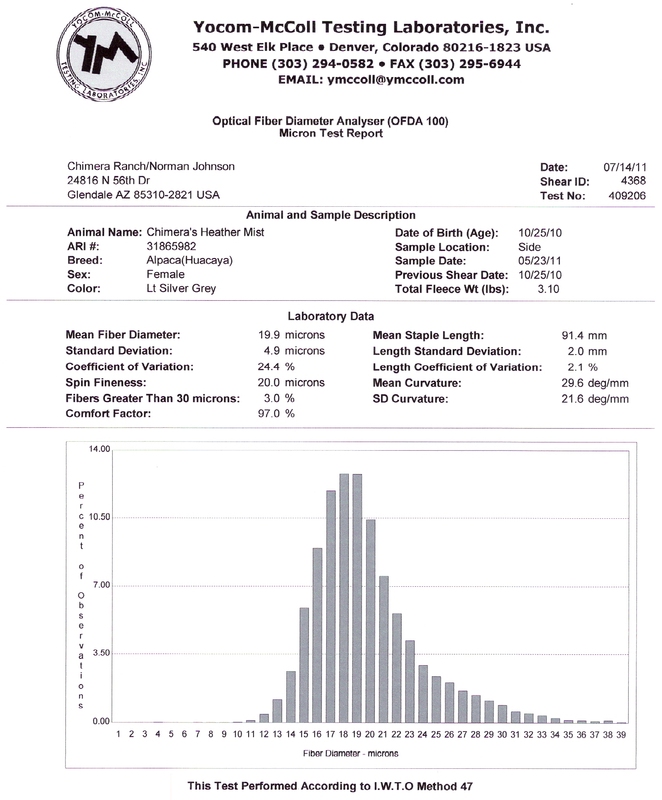 In addition, Aladdin is the half brother to Legend’s Challenger of KPR (Boomer) and has almost identical histogram and fiber statistics. 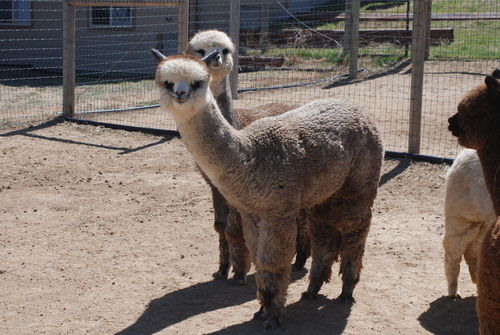 Their skin biopsies are within 1-2% and the type of crimp and fleece they throw is almost identical. Aladdin is the ticket for dark from dark brown through black (over 60% of the time he darkens the dam and 80% of the time it is either the same or darker than dam). If you breed white or beige, all have been fawn or darker (55% fawn, 11% Brown, 11% Grey, 22% BB). Aladdin is truly the total package. 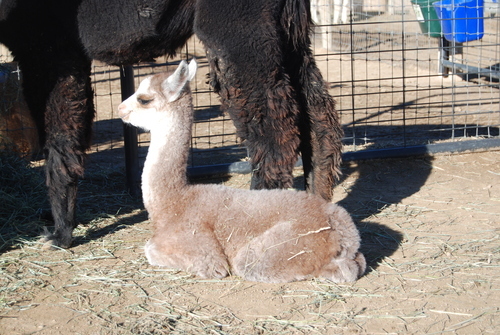 He has 46 registered cria on the ground including five multi-champions. Check out his champion offspring-especially Never Summer's Black Ice, who is a black male and was awarded Supreme Champion!!! Chiaroscuro is a beautiful rose grey lady whose fleece is exceptionally fine and bright throughout her blanket. 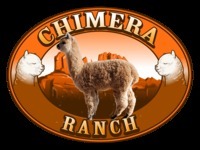 Integrate these fleece attributes with skin to tip crimp and character on top of a conformationally correct structure and you can envision the beautiful alpaca that Chiaroscuro represents. Her name means light and dark in Italian, which is a perfect way of describing her appearance. 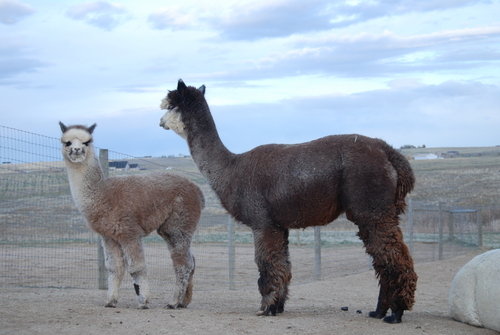 Mile High Dorian Gray is the son of color champion Ruby Rose and multi-champion sire, The Reverend Mr. Black, both of Mile High Alpacas. This is the exact same pairing that created Dorian’s 14 time Champion full brother, Mile High Deacon Gray. 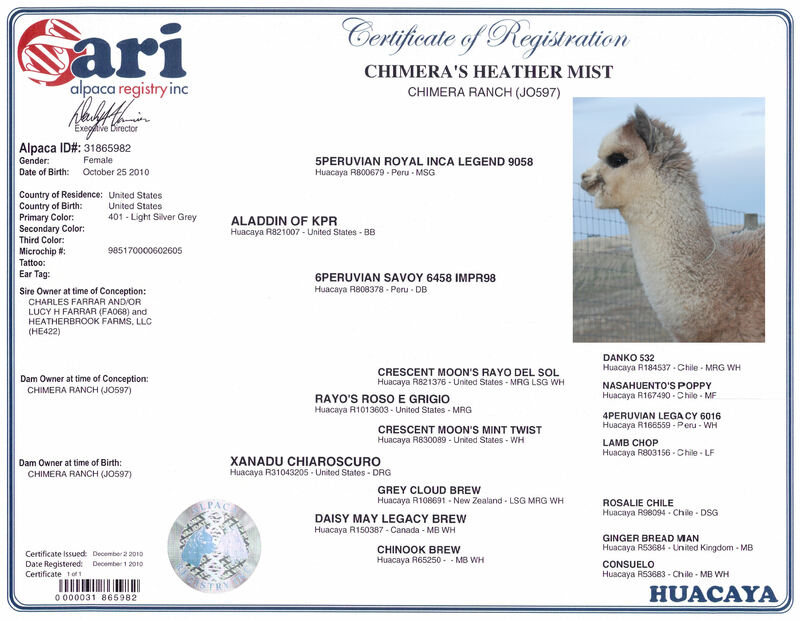 Heather Mist is the great Grand Daughter of Crescent Moon's Rayo Del Sol; We crossed Rayo's Roso E Grigio genetics with the Royal Inca Legend Son, Aladdin of KPR and created this beautiful girl with cloud like fleece; We can not wait for her first histogram to return. 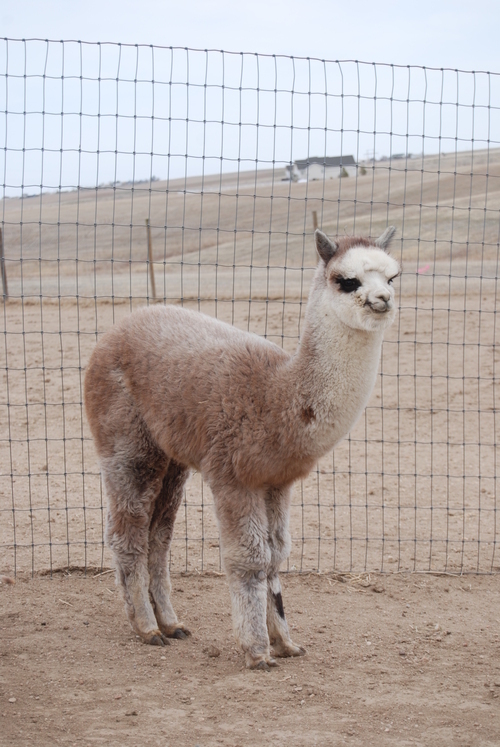 Heather has a very solid blanket and has some of the brighest light silver grey fleece we have ever laid eyes on. She follows in the steps of her brother, Chimera's Orion Grey in that she looks Rose grey on the outside, but is as silver grey as one could ever expect.